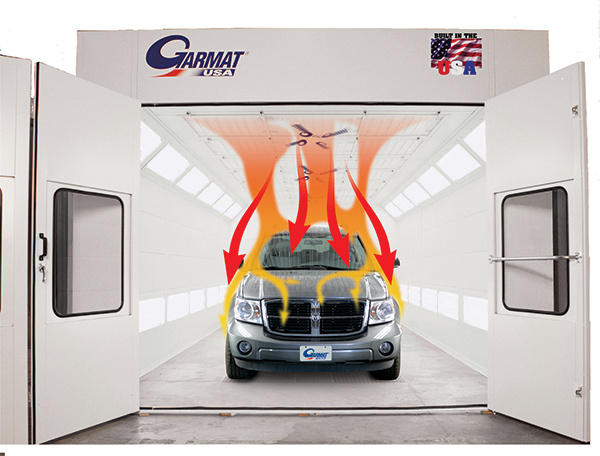 Sometimes the best solution is the simplest- the brilliance of Garmat® USA’s Accele-Cure® Accelerated Drying System. Accele-Cure is Garmat USA’s patented solution for the flashing of Waterborne paints. This type of paint needs a higher velocity airflow to “accelerate” the drying process. Accele-Cure utilizes strategically placed accelerators, which are designed to focus more air flow at a faster velocity directly over the vehicle. By breaking the micro climate around the paint surface, the water is evaporated far quicker, thus accelerating the evaporation process. This ultimately results in a substantially quicker flash time. Testing has proven that Accele-Cure flashes paint faster for both Waterborne and Solvent type paints. 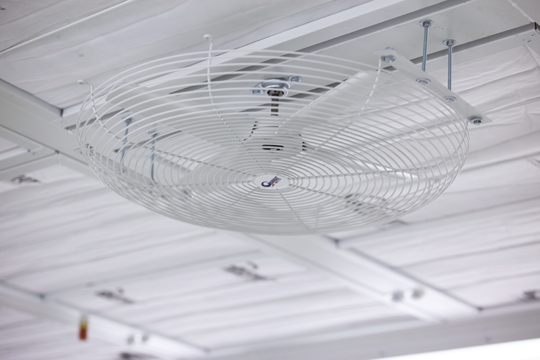 Used during the “dry” cycle, the Accele-Cure system draws air towards the center of the booth and accelerates the air delivered from the plenum, which concentrates air movement over the vehicle for more efficient flashing of the paint.